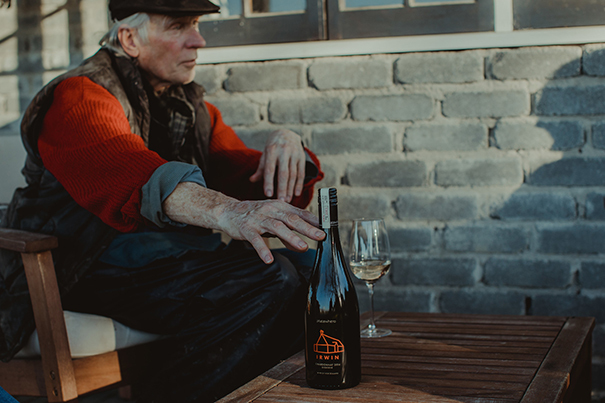 THE father of modern viticulture and his visionary son have been honoured by Matawhero Wines this month with the release of a flagship Chardonnay that bears the family name. The limited edition Irwin is a barrel fermented chardonnay from Gisborne. The wine is produced from Mendoza chardonnay vines and immortalizes the late Bill Irwin who imported Mendoza clones to New Zealand in the late 1960s and planted them at Riverpoint Road, Gisborne. “He would be immensely proud,” says Bill’s son Denis Irwin, who became emotional when he learned the new label would carry the family name. “He was also corresponding with viticultural leaders in Europe, Australia and the United States and was responsible for the importation of virus-free root stock.” Denis says it gave vineyards of the 1970s, and as a result the country’s wine industry, a strong base from which to flourish. Later, with equal measures of hard work and audacity, Denis continued to display Irwin innovation when he created Matawhero Wines in 1975. During the 70s and 80s Denis scooped numerous New Zealand wine awards with his Gewürztraminer and Chardonnay, and had the nerve and enterprise to enter international wine competitions. That audaciousness helped introduce New Zealand wine to the United Kingdom and Australia at a time when no one else was. “We were really radical for back then. There was almost a superstar element to it as we were entertaining prime ministers and international wine critics. But behind-the-scenes the life we were living was actually a continuation of my father’s hard working days”. Denis sold Matawhero Wines to Richard and Kirsten Searle in 2008 and says he’s been delighted with what has happened since the baton was passed on.